This section is from the book "The Boy Mechanic Vol. 1", by Popular Mechanics Co.. Also available from Amazon: 700 Things for Boys to Do. When the ice is too thin for skating and the snow is not right for skis, about the only thing to do is to stay in the house. A club will help to fill in between and also furnishes good exercise for the muscles of the arm. A boomerang can be made of a piece of well seasoned hickory plank. 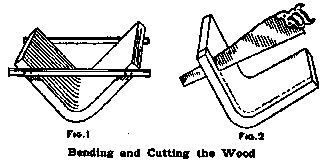 The plank is well steamed in a wash boiler or other large kettle and then bent to a nice curve, as shown in Fig. 1. It is held in this curve until dry, with two pieces nailed on the sides as shown. After the piece is thoroughly dried out, remove the side pieces and cut it into sections with a saw, as shown in Fig. 2. The pieces are then dressed round. A piece of plank 12 in. wide and 2 ft. long will make six . To throw a , grasp it and hold the same as a club, with the hollow side away from you. Practice first at some object about 25 ft. distant, and in a short time the thrower will be able to hit the mark over 100 ft. away. Any worker in wood can turn out a great number of boomerangs cheaply. --Contributed by J. E. Noble, Toronto, Ontario.